Iron ore mining causes devastation of pristine Saranda forests which are home to over 36,000 adivasis (tribals), dense sal forests. The forests also house a large number of flora and fauna, and serve as an important elephant corridor. The Saranda forests in the hilly regions of West Singhbhum district of Jharkhand are dense forests that stretch over an area of 82,000 ha. These forests were one of the most pristine in India, and are the largest sal forests in the country (Priyadarshini, 2008; Sethi, 2014). They support a large variety of floral and faunal biodiversity, and are an important elephant corridor (Priyadarshini, 2008). An expert panel appointed by the Government of India in 2011, identified 480 new species of fauna and flora in the region (Chakravartty, 2014). The core area of these forests are also ancestral home to the about 56 villages (Deogharial, 2013) which are mostly composed of the Ho and Mundi adivasi (tribal) communities. The 36,000 strong tribal communities have lived sustainably within the forests for centuries and have played a key role in the maintenance and protection of the forests (Bera, 2012). The ecology of the forests is closely intertwined with the spiritual and cultural practices of the tribe (Lambert, 2016). The cultural integration and the importance of the forests to the tribal communities extends from birth to death—the Ho community custom dictates burials be conducted under the shade of trees within the Saranda forests. The impact that the loss of forest has on adivasis can be gauged by the statement of a part time labourer captured by Bera, 2012: “I just hope they leave some forests for our graves” (Bera, 2012). The hills also hold large deposits of high grade iron ore. Until 2016, close to 1,200 ha of land within the Saranda forests have been granted for iron ore mining to 85 companies (Lambert, 2016). As a result of mining operations large stretches of forest land which served as an elephant corridor, agricultural land belonging to and sustaining livelihoods of villagers lies waste. Streams which serve both domestic and agricultural purposes of the villagers now flow red with mining waste, polluting drinking water sources and resulting in loss of agricultural productivity (Priyadarshini, 2008). Forests, and mountains which are sacred to the adivasis lie degraded due to iron ore mining operations. Various political actors, including the then Union Minister for Environment and Forests Jairam Ramesh, expressed their intentions to not allow mining operations to be carried out in the region, specially by private actors (Business Standard, 2012). However, in 2012, SAIL was granted permission for expansion of mining operations over and additional 273 ha (Chakravartty, 2014). In 2013 mining operations were granted further forest clearances. SAIL (Steel Authority of India Ltd.) expanded into an additional 351 ha (Chakravartty, 2014). The SAIL proposal for forest clearance included the felling of 40,000 trees, 26,000 of which had a girth of over 70 cm—an indication of forest health (Chakravartty, 2014). Apart from state owned SAIL this also included various private actors, such as Jindal Steel Works (JSW), Vedanta, and Rungta mines which were granted permission to start exploration within the elephant corridor. The Jindal group was granted approval for the diversion of over an area of 1500 ha and the clearance of 80,000 trees (Deogharial, 2013; Shrivastave, 2013), whereas Rungta Mines were given clearance for 100 ha involving clearance over 2800 trees (Shrivastava, 2013). This raised much discontent amidst the villagers in the region (Deogharial, 2013). However, in 2014 permissions for further forest clearances for mining operations in the region were granted by the Ministry of Forests and Environment (Chakravartty, 2014). The situation was aggravated in 2016, when well-known human rights campaigner and the leader of the movement to protect the Saranda forests—Gladstone Dungdung was denied permission to travel to the UK to participate in a conference to present the case of the resistance movement against anti-mining protests in the region (Lambert, 2016). Various anti-mining protests have been organized by the local villagers over the years, but to no avail (Openspace, Dungdung). The post-master in Saranda, Bhismen Gop describes the issues that villagers—mostly farmers, and gatherers of non-timber forest produce—by stating, “What use are development programs when our land is turning barren and perennial streams are drying up” (Bera, 2012). 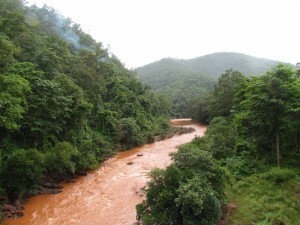 Mining waste has turned the rivers red, and mining operations have resulted in the drying up of a 5 km stretch of a perennial stream in the region (Bera, 2012). The juxtaposition of accumulation of wealth by a small minority in the region and the income poverty of the majority of the population who are the owners of the lands can be gauged by the analysis of economist Ramesh Sharan who states: “It is a paradox that West Singhbhum has the highest per capita income in the state, but also figure on the list of 100 worst districts of the country in terms of human development indices” (Ganguly, 2015). The mining operations, and the woes of the villagers continue. Project Details Until 2016, close to 1,200 ha of land within the Saranda forests have been granted for iron ore mining to 85 companies (Lambert, 2016). As a result of mining operations large stretches of forest land which served as an elephant corridor, agricultural land belonging to and sustaining livelihoods of villagers lies waste. Over 85 projects, both public and private sector, have been clearance within the pristine which have over 2000 MT of high grade iron ore.
Environmental justice organisations and other supporters Among other activists, the name of Gladstone Dungdung is internationally known. Why? Explain briefly. Mining operations, and forest degradation in the region is continuing. Dungdung, G., 2013. Whose Country is it Anyway. Dungdung, G., 2015. Mission Saranda: A war for natural resources in India. Deogharial, J., The Times of India, 8th June 2013, ‘Saranda mining approval contradicts Jairam Ramesh’s words’. (last accessed 18th December 2016). Bera, S., Down to Earth, 30th April 2012, ‘Between Maoists and Mines’. (last accessed 18th December 2016). Ganguly, A., The Telegraph, 27th July 2015, ‘Book on Saranda’. Shrivastava, K. S., Down to Earth, 7th February 2013, ‘Forest panel clears Jindal’s mining projects in Saranda forest’. (last accessed 18th December 2016). Sethi, N., Livemint, 25th January 2014, ‘Firms allowed mining rights in Saranda forests to face scrutiny’. (last accessed 18th December 2016). Dungdung, G., OpenSpace, ‘Who am I? Gladstone Dungdung’. (last accessed 18th December 2016). Lambert, J., Intercontinental Cry, 17th May 2016, ‘Outcry as adivasi activist Gladson Dungdung is prevented from travelling to the UK’. (last accessed 18th December 2016). Business Standard, Press Trust of India, Chaibasa, 1st July 2012, ‘Not in favour of handing over Saranda mines to pvt parties’. (last accessed 18th December 2016). Priyadarshini, N., South Asian Citizens Web, 28th October 2008, ‘Impact of mining and industries in Jharkhand’. (last accessed 18th December 2016). Ramanathan, S., Down to Earth, 2nd April 2014, ‘Saranda forest: New mining projects put on hold’. (last accessed 18th December 2016). Shrivastava, K. S., Down to Earth, 17th May 2013, ‘Forest advisory council clears way for mining in Saranda’. (last accessed 18th December 2016). Chakravartty, A., Down to Earth, 15th February 2014, ‘SAIL gets pristine forest to mine’. (last accessed 18th December 2016).